...the newest member of my household! I would like you all to meet Luca Pietro. Luca started with me as a foster dog last Wednesday, after being in the Monterey County shelter for about 3 weeks. 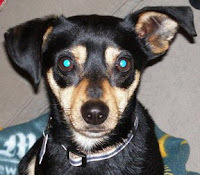 He was found somewhere near Salinas as a stray, and he was brought up to the Bay Area on 31 January. The SF SPCA felt he was too shy to be adoptable, so they handed him over to Rocket Dog Rescue (www.rocketdogrescue.org), an organization that saves animals from high-kill shelters. As many of my nearest and dearest knew, I was looking to adopt a dog, so when Rocket Dog asked me if I would foster for a while, I thought that would be the perfect thing. I could test out a few dogs, adopt them out to good homes, and then find the one perfect for me. I thought I could start in a week or two, but there was an urgent need, so they asked me if I could come by that night (31 Jan) and pick up a pooch. Luca immediately came up and sat very close to me the whole time when I went to get him. After a few nights it became clear it was going to be hard to give him up. And eventually I decided I couldn't. He became officially mine on 6 February. He is about 1.5 years old, housebroken, and a little timid but getting over it. He hasn't done much damage to my place, and hasn't used it as a restroom. He is getting used to me being gone during the day, and I am getting used to getting up at the crack of dawn to take him for his morning constitution. Considering we end up walking through the hills for 1.5-2hours a day, it is great for me! Sorry for the long story...He is just as cute as can be. Get ready for lots of Luca stories!